Who can avail 102 Free Ambulance Service in Bihar? In this article, we explain you Who can avail 102 Free Ambulance service in Bihar? Note that last year on August Chief Minister Nitish Kumar Flagged off Free Ambulance service by the name 102 Ambulance Service. Health Minister Mangal Pandey was also present there and explained who can avail this free Ambulance service. In this article, we talk about the same and prepare a list of category who can avail this free Ambulance service. Pregnant Women can avail this free service. The Ambulance have to drop pregnant women from their Home to Hospital and vice versa free of Charge. In case of any complication during delivery, the Ambulance have to carry them from one institution to another. This service also take care of all sick newborn babies by dropping them from there home to hospital and vice versa. Senior Citizens whose age is greater than 60 years can also avail this free Ambulance service. Seriously Injured person during the road accident can avail this service. Below Poverty line card holders can avail this service. Children Referred under Rashtriya Bal Swasthya Karyakram. How to avail 102 Free Ambulance Service in Bihar? All you have to dial the Toll Free helpline number 102 which is open 24 by 7 as stated by the Government. 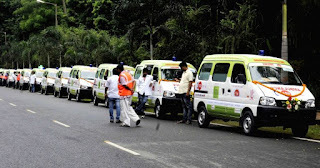 Note that the ambulance is managed by Pashupatinath Distributors Pvt Ltd. and Sammaan Foundation, Patna. Muzcorner - Muzaffarpur News Portal: Who can avail 102 Free Ambulance Service in Bihar? In this article, we explain you Who can avail 102 Free Ambulance service in Bihar? Note that last year on August Chief Minister Nitish Kumar Flagged off Free Ambulance service by the name 102 Ambulance Service.